← Jean Claude and I…..
It’s Simply A Matter Of….. Taste! And according to the old adage, there is no accounting for it either. Which is a good thing really otherwise the world would be a pretty boring place. I was recently approached by wine PR guru Nicolette Waterford to put together a range of salamis for Overhex Wines to use in a salami and wine pairing. 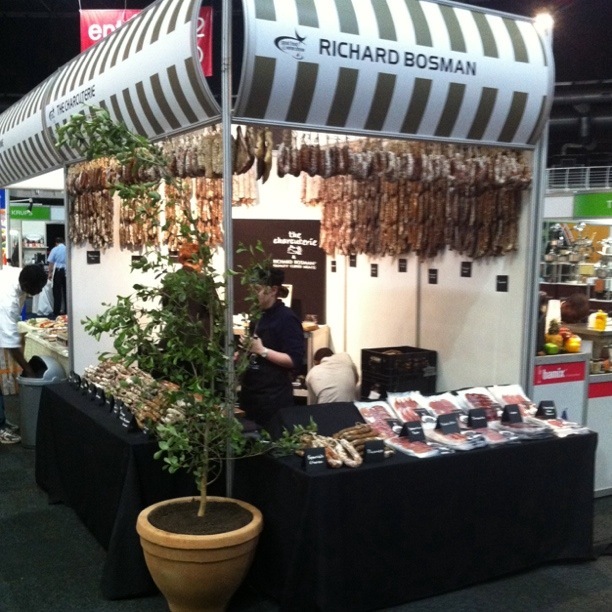 The tasting was launched on the 7th of September to celebrate international salami day. Nicolette is more effervescent than a bottle of MCC and she combined 6 different salamis with a range of white, red and rose wines. Some of the combinations sound a little out there but they actually work really well with the chosen wines. The tasting is on offer at the Overhex tasting room and is well worth a visit just for the wines. Onto other matters of taste, thanks to all the people of Johannesburg who came and supported us at the Good Food and Wine Show last week. It was a fantastic success and the response was incredible. Thanks also to all who helped out at the stand over the 4 days. The products are now available at The Cheese Gourmet, Braeside Meat Market and the new Neighbourgoods Market in Braamfontein. I spent my time in Jozi with an old school friend, James Brice who very kindly put up with me, my poor navigation skills and my meats (he is a veggie but means well). He is very involved with sustainability and is working on a book which makes for fascinating reading. In the not too distant future I hope to blog about bio-diversity, sustainability and the tipping point but I first need to convince James to try a bacon croissant.